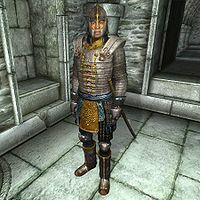 Baurus is a Redguard member of the Blades who starts the game as a bodyguard to Emperor Uriel Septim. As you quickly learn, however, Baurus is unable to save the Emperor from the assassination plot. 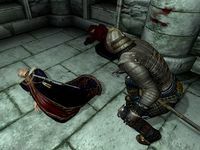 Despite being the only Blades member to have survived the assassination attempt, Baurus takes the failure somewhat personally, and proceeds to spend his time searching for the assassins. Baurus wears a full set of Blades armor and wields his Akaviri katana in combat. While sleeping or undercover, he wears leather boots, leather bracers, belted braies and a green wool shirt. He also carries a moderate amount of gold. During the quest The Path of Dawn, you are tasked to meet up with Baurus and help his investigations; at this time you can usually find him at Luther Broad's Boarding House in the Imperial City Elven Gardens District. Although up until that quest, Baurus has been an essential NPC (i.e., unkillable), during this quest he can be killed. If he survives, he will then relocate to Cloud Ruler Temple for the remainder of the game, here he will also have a full set of Blades armor you can remove from his body if he dies. If you talk to him at Cloud Ruler Temple, he will give you free skill boosts in Blade (+1), Block (+1), and Heavy Armor (+1). While Martin is still alive Baurus will watch him night and day. Also, he will fight by Martin's side in subsequent battles, such as the Defense of Bruma, and Light the Dragonfires. If Baurus dies at any point and you talk to Jauffre about him while holding Baurus's Akaviri Katana, Jauffre will say: "He will not be forgotten. He goes to Aetherius to join the other fallen heroes of the Blades. I thank you for recovering his sword. I will set it in a place of honor in the Great Hall of Cloud Ruler Temple. ", then he will take it from you and do what he says by adding it to the wall above the fireplace in Cloud Ruler Temple next to the swords of Glenroy and Captain Renault (if you retrieved them). If you ask about Baurus again, or if you simply haven't got his sword, he will say: "He served with honor. No Blade could ask for higher praise." The scholars and priests can debate what happened to Martin in the end. What I know is that he sacrificed himself to save us all. As a Blade, I'm proud to have served such a master, if only for a short while. As with numerous other NPCs, Baurus doesn't employ the principles needed to participate in the Speechcraft minigame. Esta página foi modificada pela última vez à(s) 19h41min de 25 de dezembro de 2015.